The rotation of a vector in a vector space can be done by either rotating the basis vector or the coordinate of the vector. Here, we always use fixed basis for rotation. For a rigid body, its rotation can be accomplished using Euler rotation, or rotation around an axis. Whenever a transform preserves the norm of the vector, it is a unitary transform. Rotation preserves the norm and it is a unitary transform, can it can be represented by a unitary matrix. As a unitary matrix, the eigen states are an convenient basis for the vector space. We will start from 2-D space. Within the 2-D space, we discuss about rotation started by vector and then function. The vector function does not explicitly discussed, but it was touched when discussing on functions. In the course, the eigen state is a key concept, as it is a convenient basis. We skipped the discussion for 3-D space, the connection between 2-D and 3-D space was already discussed in previous post. At the end, we take about direct product space. If all vector expand as a linear combination of the eigen vector, then the rotation can be done by simply multiplying the eigen value. And, the product also from a basis. And the rotation on this new basis was induced from the original rotation. where . The space becomes “3-dimensional” because , otherwise, it will becomes “4-dimensional”. The 2-D function can also be expressed in polar coordinate, , and further decomposed into . How can we find the eigen function for the angular part? One way is using an operator that commutes with rotation, so that the eigen function of the operator is also the eigen function of the rotation. an example is the Laplacian. The eigen function for the 2-D Lapacian is the Fourier series. Therefore, if we can express the function into a polynomial of , the rotation of the function is simply multiplied by the rotation matrix. In 3-D space, the same logic still applicable. The spherical harmonics serves as the basis for eigenvalue of , eigen spaces for difference are orthogonal. This is an extension of the 2-D eigen function . A 3-D function can be expressed in spherical harmonics, and the rotation is simple multiplied with the Wigner D-matrix. On above, we show an example of higher order rotation induced by product space. I called it the induced space (I am not sure it is the correct name or not), because the space is the same, but the order is higher. For two particles system, the direct product space is formed by the product of the basis from two distinct space (could be identical space). No matter induced space or direct product space, there structure are very similar. In 3-D rotation, the two spaces and the direct product space is related by the Clebsch-Gordon coefficient. While in 2-D rotation, we can see from the above discussion, the coefficient is simply 1. Lets use 2-D space to show the “induced product” space. For order , which is the primary base that contains only . For , the space has , but the linear combination is unchanged after rotation. Thus, the size of the space reduced . For , the space has , this time, the linear combinations behave like and behave like , thus the size of the space reduce to . For higher order, the total combination of is , and we can find repeated combinations, thus the size of the irreducible space of order is always 2. For 3-D space, the size of combination of is . We can find repeated combination, thus, the size of the irreducible space of order is always . Recently, I read a very interesting article on the origin of spherical harmonics. I like to summarize in here and add some personal comments. The Laplacian can be separated into radial and spherical part. Since the Laplacian is coordinate-free, therefore, the solution is also coordinate free and is rotational invariant. We will come back to this point later. Substitute this homogeneous harmonics into the Laplace equation, the will produce a coefficient related to the order, and the radial part can be extracted. The eigen function for 2-D Laplacian is the Fourier Series, and that for 3-D is the Spherical Harmonics. 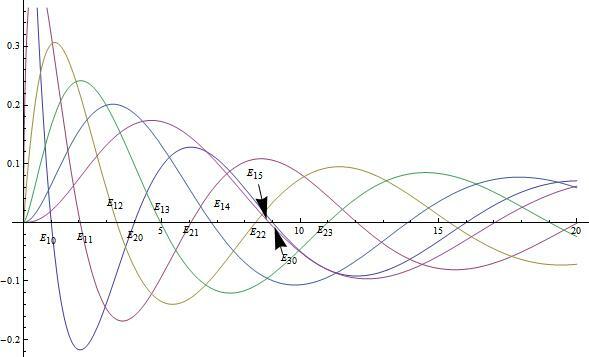 In this sense, Fourier Series is a “polar harmonics”. In 3-D, the angular part of the Lapacian is proportional to the angular momentum operator, , where is the reduced Planck constant, which has the dimension of angular momentum. As we mentioned before, the harmonics should be rotational invariant, such that any direction should be equal. However, when we look at the Spherical Harmonics, the poles are clearly two special points and the rotation around the “z-axis” has limited rotational symmetry with degree . How come? The limited rotational symmetry with degree of is due to the limited “band-width” that restricted by the order of the homogeneous function. The relation between the band width and the order of the harmonics can be understood that the number of “sector” or “node” on the circle/sphere is proportional to the order, thus, the “resolution” is also limited by the order and thus the “band-width”. Also, the convolution using discrete Fourier transform can also be applied on the spherical harmonics. Notice that, the Discrete Fourier Transform can “translate” to Continuous Fourier Transform. However, the order of the spherical harmonics is always discrete. We can use Rungu-Kutta method to numerically solve the equation. I used excel to calculate a scattered state of L = 0 of energy 30 MeV. The potential is a Wood-Saxon of depth 50 MeV, radius 3.5 fm, diffusiveness 0.8 fm. Another example if bound state of L = 0. I have to search for the energy, so that the wavefunction is flat at large distance. The outermost eigen energy is -7.27 MeV. From the radial function, we know it is a 2s orbit. usually, the boundary condition is given and this make the solution unique. There are 2 boundary conditions that will give unique solution. Dirichlet – given the potential on the boundary, this requires the Green’s function be Zero on the boundary. Neumenn – given the field, or the change of the potential on the boundary, this requires the change of the Green’s function be on the surface. where S is the total surface area. thus, the Green’s function must contain a part from it. for example. the method of finding the Green’s function is from the Laplace equation. when we solving Laplace equation in certain coordinate, we get the eigen function for the Laplacian. The eigen function span the space of function. Thus, we can construct the Green’s function from eigen function. The radial equation is the spherical Bessel function. there is no restriction on n and l, therefore, there will be 1s, 1p, 1d, 1f orbit. the energy level also depend on angular momentum, since it determined the order of spherical Bessel function. Since is a scaling factor to “force” the function to be zero at the boundary. Interestingly, the spherical Bessel function is not normalizable or orthogonal with , i.e. is diverged. Of course, the spherical Bessel function is a “spherical wave” that propagating in space, same as plane wave, which is also not normalizable or orthogonal. However, in the infinite spherical well, with the scaling factor for same , they are orthogonal! And for difference , the spherical part are already orthogonal. Thus, the wave function for difference energy are orthogonal. i.e. the eigen states are orthogonal! Power of math! In the following plots, the left is and the right is . In fact, even for Woods-Saxon potential, the numerical solution of the eigen wave-function are also orthogonal for same angular momentum. That is the result from last time. we have the same form in the 4-D tensor space. the creation of field is conservation of the 4-charge displacement, if we integrate the 4-current. i dun know what physical meaning of the G-field. personally, i believe that the F-field and G-field can be related by some transform. the reason why we can write this, i don’t know. any physical meaning? i don’t know. may be we can think in this way, the force depends on the motion of the 4-vector and the field and the charge. thus, it is natural to multiple them together to get the force. But why not the G field? never the less, the field tensor reduce the number of Field qualities into 2.
that the force is created by the field and the current. But this complicated form is rather useless, expect you are mathematic madman. and the Jacobian Matrix , which is used for related the derivatives. use the separable variable assumption. an application on Hydrogen wave function is here.